The Europe pet food market has been growing at a tepid 1.3% in the duration beginning from 2015 and ending in 2021. At this pace, the market is predicted to attain a value of US$28.146 bn by 2021. This has been revealed by Transparency Market Research in one of its reports focused on the Europe pet food market. The report also lists Purina, Pedigree Whiskas, Cesar, Nestle, Colgate-Palmolive, and Affinity Petcare as some of the prominent players in the market. The various types of food available in the Europe pet food market can be classified into wet/canned food, nutritious food, snacks/treats, dry food, and others such raw meat. At present, the dry food segment among them is witnessing maximum demand. Going forward too, the segment is predicted to see comparatively greater demand and will presumably attain a value of US$11.075 bn by 2021. From a geographical standpoint, the main segments in the Europe pet food market are France, the U.K., Germany, Netherlands, Italy, Spain, and the Rest of Europe. The U.K. among them is a leading market that has been generating significant revenues. However, our report predicts that its market would see slow growth in the next couple of years because of being saturated. Pet foods are produced for dogs, cats, and other animals in Europe. 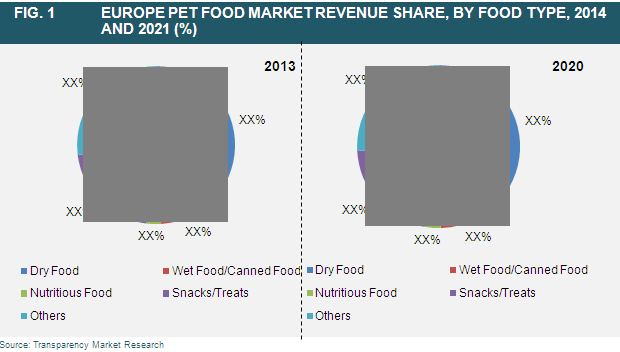 Currently, the other segment is rising at a rapid pace in the Europe pet food market. However, when it comes to market share, the cat food segment currently surpasses all others because of the strong fascination for smaller animals. In the next couple of years, the growth in the Europe pet food market is expected to be supported by the increasing efforts of manufacturers to formulate more nutritious and tasty foods. To that end, they are expending money into research and development. They are also seen bolstering their distribution networks and embracing online channels to push up sales. Most of the astute players in the Europe pet food market are currently focusing on Spain, whose market will likely grow at maximum pace in the upcoming years. This is because of the increasing number of poet owners in the nation, states our report. France, Italy, and Netherlands are also predicted to open up growth avenues in the near term.